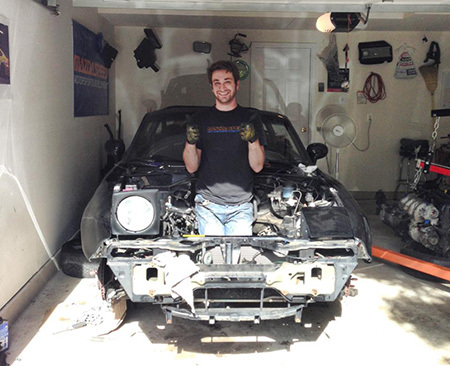 Congratulations to Jake on the selection of his 1995 as the August Miata of the Month! I've been "into" cars since I was a little kid. I'd sit in the backseat of my mom's Nissan Sentra and read the badges on trunk lids to her as we drove around. My parents always supported my "car thing" in the form of magazines, trips to car shows, and so on, but it wasn't until I went to college that I really dove in head-first. 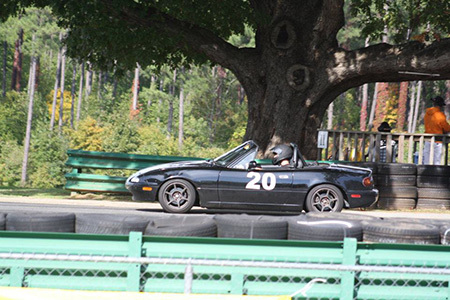 I learned to drive manual on a '99 BMW Z3. My parents didn't own any three-pedal cars at the time, but some family friends down the street did. So we used the Z3 to get my feet wet, and when I got my license and that family went out of town, they left me the BMW keys for ten days. As a high school kid with a newly-minted license, this was SO cool. Throughout the rest of high school, they'd let me borrow the Z3 here and there, just for fun. The husband owned a Mariner Blue '91 Miata, and one day I asked if I could try that. He threw the keys at me. "Don't rest your foot on the clutch, go have fun, see you tomorrow." My mom ended up buying a Chrysler Crossfire convertible right as I got my license, and my parents gave me her "old" Ford Escape to drive. The Escape was "mine" throughout high school. So I got to college and went to the annual "clubs and orgs fair" in the convocation center with some friends. We're walking around and I see a racing helmet high above the crowd - and quickly headed that way, only to discover the college's motorsports club. Madison Motorsports was full of incredibly friendly people with a very diverse set of vehicles. You name it, someone's owned it. I started learning about autocross and decided that my summer goal was to buy myself a sportier car than the Escape. In talking to the MM guys, they helped me narrow down my options, and I set my sights on a NA Miata. The summer was full of working long hours and searching every possible venue for a car. 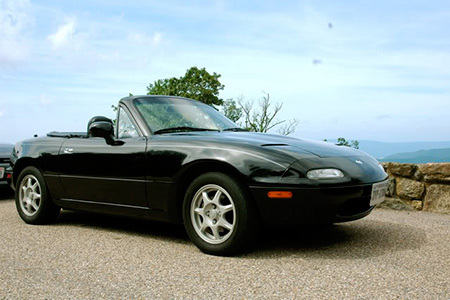 I drove several really ragged-out examples locally, but eventually was contacted by a professor who saw my wanted-to-buy ad on Miata.net and had a black '95, three hours south. Dad took the day off and we drove to Williamsburg, check in hand. 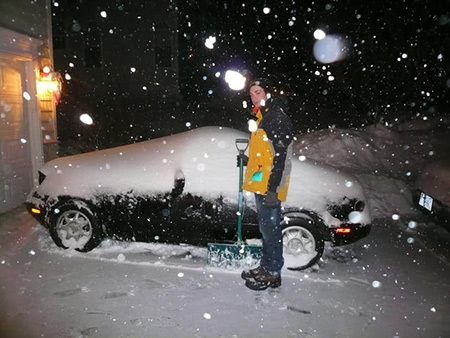 I was 18 and spent most of the money I had on a 72k-mile PEP Miata. 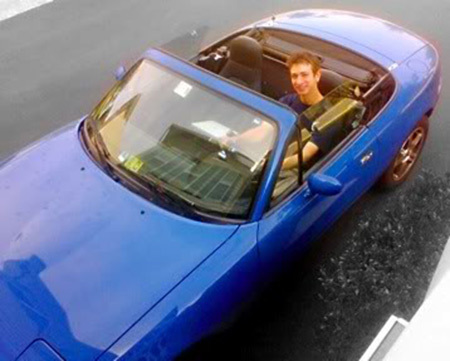 Driving that Miata home on I-95 was truly awesome, and terrifying. Surrounded by semi-trucks with the roof down was quite the experience. After a $250 slave cylinder and $300 rear brakes, I discovered that maintenance would be the quick end to my bank account if I had to rely on shops. Fortunately, the MMers at school were all too happy to teach me how to spin a wrench. My friend DJ taught me how to change my oil and transmission fluid one day in his apartment parking lot. I Googled a lot, and searched this forum a lot. From there, I started hanging out with the car club all the time. They became great friends. I got into local autocrosses, and even had my parents drive at a few of them. I started working with our region of the National Auto Sport Association as a flagger to get closer to the action. Time went on, the Miata got modified and maintained by yours truly in various parking lots, as cash and time allowed. I ended up the president of Madison Motorsports for two years, increasing membership and participation and truly growing my gearhead-friend circle. My involvement with NASA grew tenfold, from flagging to working grid and timing, to now driving the pace car. The BMW bug bit me senior year, and I ended up going through four old BMWs in three years as semi-lousy, mostly nice daily drivers - the Miata was on "fun/track car" status. I got a rollbar installed, and started tracking the hell out of it. It lasted a year and a half. My roommate backed it out of the garage one morning and noticed massive plumes of blue smoke from the exhaust. We tried various "snake oil" fixes, but the motor was done. At just 118k, I had killed it. Naturally, I decided I was too attached to the car to just sell the smoky shell for a grand. So, I talked to my racer buddies and came up with a $700 motor from a '99. We got the motor home and I broke out my socket wrenches. 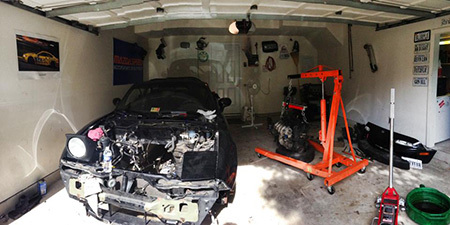 In the span of a few weeks, spending an hour or so after work each night, I got the old motor ready to be removed. And then, in a 26-hour period of weekend, my roommate and three other friends helped me remove the old motor, install the new one, and get everything hooked back up. The car had sat for about a year while I found parts, saved money, and so on. Taking it out on rock-hard Azenis to put the first tank of gas back in it was such a good feeling. I did this. We did this. It ran again. The swap wasn't without faults. The car leaked fuel, oil and coolant at various times, but over a week or so we got it sorted. I've spent another Miata's worth of money fixing this one, and it was entirely worth it. When you go to college, you meet friends, drop friends, change majors, add minors, move to new apartments/houses every year, take random trips, and eventually graduate and move again and repeat the process. The close friends I have now are all from my college car club and from the track. My passion is all-things-car and motorsport. It's what I do in my free time. The Miata has been the only constant "thing" in my life since I was 18 - everything else has changed and evolved as time marches on. And to think, my life is where it is now because of a little black Mazda I bought six years ago. Cheers.